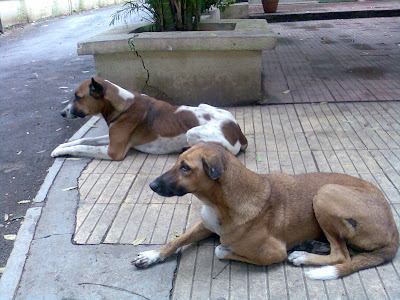 Dogs are territorial by nature and these two companions are no exception. Their rule extends from Om Supermarket to the chicken barbecue corner, an area of about 700 meters. The barbecue corner is their stronghold - their evening meal comes from occasional meat pieces thrown at them by the customers. Here they squat near the supermarket on a cloudy Sunday afternoon.